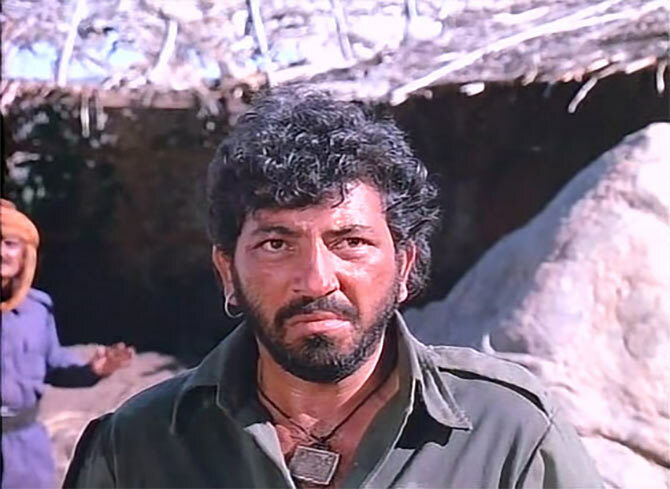 Rediff.com » Movies » Now, you can go to Ramgad and talk to Gabbar Singh! Now, you can go to Ramgad and talk to Gabbar Singh! The Sholay magic might just come alive in this 3D virtual reality village. 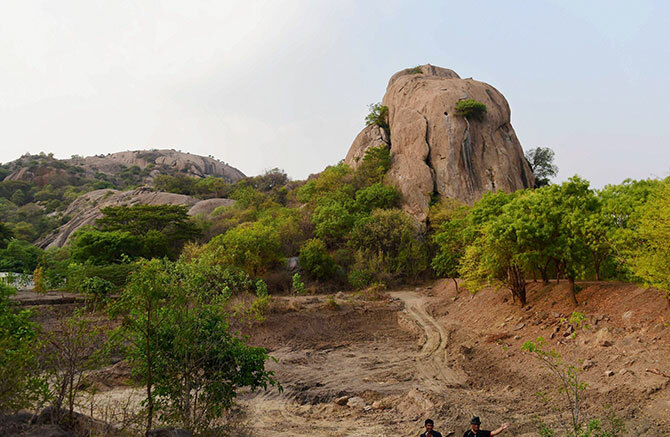 The Sholay magic is all set to be recreated in the rocky terrains of Ramanagaram with plans afoot to bring alive the trailblazing characters, 42 years after they were immortalised in the iconic 1975 film. 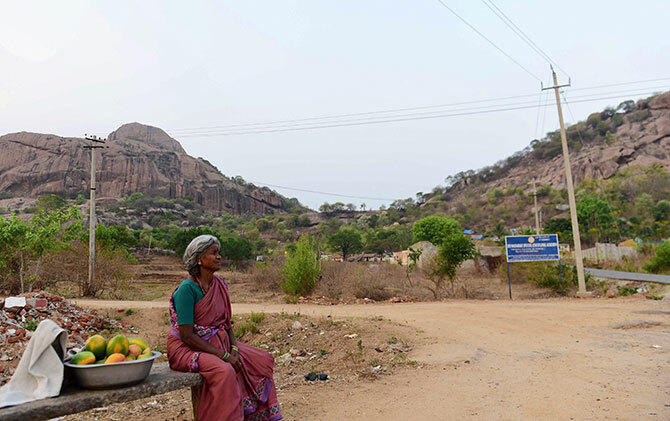 A Rs 7.5 crore proposal has been mooted to establish Sholay: The-3D Virtual Reality Village for cine lovers on a locale at Ramadevara Betta in Karnataka that was popularly known as Ramgad where the blockbuster film was shot by Ramesh Sippy in a dacoit-gangland setting. The place, about 50 km south-west of Bengaluru, is a paradise for trekking, rock climbing and photo shooting. 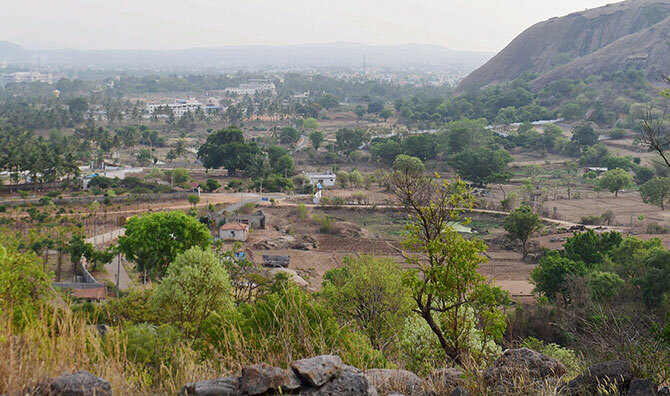 Seven hills are located within a 10 km radius of Ramanagaram, including Ramadevar betta, where the den of Gabbar Singh -- played by the late Amjad Khan -- was picturised. Gabbar Singh's dacoit role gave him cult status, along with the memorable role of his henchmen Samba and Kaalia. The Ramanagaram district administration has submitted the plan to the state government to either implement it as a Public-Private venture or as a state project. The project, however, will not be established in the vulture reserve area, but outside it. 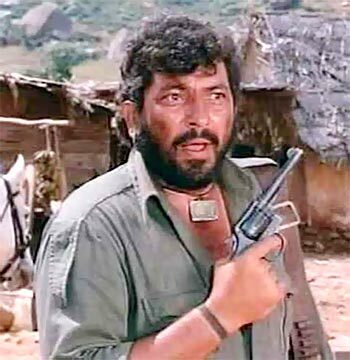 IMAGE: Amjad Khan played Gabbar in Sholay. The main purpose of establishing the virtual village is to enthrall visitors using goggles, virtual reality headsets, laser disc-based systems, VR-3D, audio and visual equipment and multiple screens, an official said. The actors will come to life and deliver punchlines from the film, and the visitors can deliver the following dialogues. "When Gabbar Singh says 'Kitne aadmi they,' visitors can deliver the dialogue that follows: 'Do sarkar,'" the official said, reminiscing a scene when Gabbar Singh attacks the village for the first time in the film. The plan is for either the district administration entering into a partnership with Sippy Productions and other private agencies under a PPP model or for the government taking up the project on its own, the official said. Shivalingaiah, who played a small role in Sholay, is ecstatic about the proposal to establish Sholay: The-3D Virtual Reality Village. "The proposal is God's work just as making Sholay was -- the blockbuster film placed my village on the world map," the octogenarian told PTI. Shivalingaiah also reminisces about the helping nature of its stellar cast. "Everybody helped us out, from Jaya Bhaduri to Hema Malini, Amitabh Bachchan to Dharmendra and Amjad Khan, and of course Ramesh Sippy and late Sanjeev Kumar -- it was a fabulous interaction with these stars for almost three years," he said. 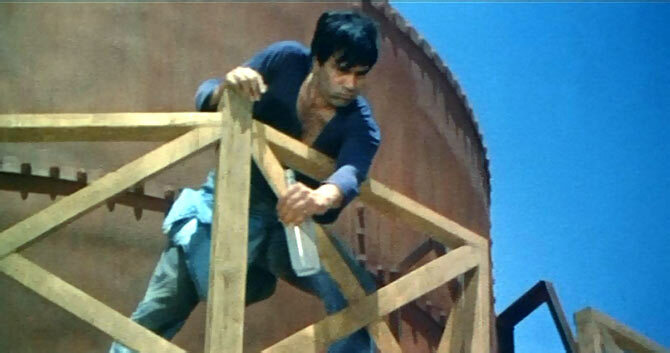 IMAGE: Dharmendra's Veeru in the famous tank sequence in Sholay. Shivalingaiah recalls how Dharmendra resisted a move to hire Bengaluru-based side actors to play brief parts in the film and insisted on locals doing them. "Dharmendra, especially, was a star with a big heart. He resisted a move to hire Bangalore-based side actors by insisting that all minor roles be played by the villagers. This fetched me and others Rs 200 per day for three years," he says in an emotional tone. Shivalingaiah said the project would benefit the villagers immensely as there would be a lot of visitors resulting in job opportunities. Recalling the shooting of the scene where Jaya Bhaduri had to light a lamp in the corridor and Amitabh Bachchan sits in the outhouse playing the mouth organ, Sivalinagaiah said "Sippy Saheb spent almost three years before finalising the shot." On the classic train sequence, Shivaliagaiah said, "Who can forget that scene where the dacoits mounted on galloping horses are chasing the train in which Dharmendra, Amitabh Bachchan and Sanjeev Kumar are travelling? It took seven weeks to shoot that scene. I was in that train as crew." IMAGE: AK Hangal reacts in after his son -- played by Sachin -- dies in Sholay. Shivaliangaiah said the Yeh Dosti song took Sippy 21 days to complete and another 19 days to shoot a scene where Gabbar Singh kills the son of Imam (played by the late H K Hangal). Asked if he had any message for the star cast over four decades later, Shivalingaiah said emotionally, "My only wish is that this proposal brings back the cast to the place. None of the stars visited the place after completion of Sholay's shooting." Meanwhile, Karnataka Tourism Minister Priyank Kharge said the government still has to evaluate the proposal. Ramanagaram is famous for its landscape and "we would like to start rock climbing camp for weekenders travelling from Bengaluru," he said. Kharge added that the Sholay locale has the potential to attract visitors heading towards Mysuru and is also the first exit point for IT people living in Bengaluru. The minister said some locales fall into the vulture reserve zone like Gabbar's hideout, Thakur (Sanjeev Kumar)'s haveli and the rocky terrain where Basanti (Hema Malini) dances but these will have to be recreated outside the prohibited area, if the project is implemented. Most huts and dwelling units built for the film shoot are now being used by the villagers. PIX: When actresses got pregnant on screen!